Figure 9-1. The LOX pathway. Seven different branches originate from the LOX products 13-HPOT and 13-HPOD, respectively. The AOS catalyzes the first step of the most-studied branch leading to OPDA and JA. l-isoleucine (JA-Ile); hydroxylated and glucosylated derivatives of JA were found as minor constituents. All of these compounds are collectively named "jasmonates". More recently, a biosynthetic precursor of JA, 12-oxo-phytodienoic acid (OPDA) as well as its methyl ester (OPDAME), could be frequently detected in plant extracts. Together with structurally related compounds, they are collectively called "octadecanoids". 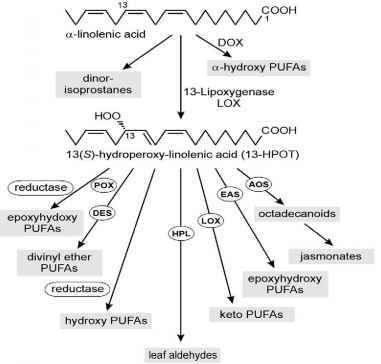 Octade-canoids and jasmonates originate from peroxidation of polyunsaturated fatty acids (PUFAs) by lipoxygenases (LOXs). In the so-called LOX pathway (Fig. 9-1) numerous compounds, collectively named "oxylipins", are formed from lipid peroxides. Originally, jasmonates were found to promote senescence (Parthier, 1991). Later on, their specific effects on gene expression were found, followed by the observation that octadecanoids exert similar, but not identical biological activities. 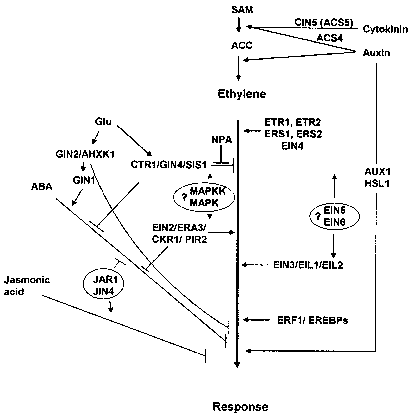 Furthermore, numerous oxylipins show biological activity such as antimicrobial effects, illustrating the overall role of the LOX pathway (Feussner and Wasternack, 2002).